If the floor at the seat of the blast is bent upwards the blast came from below. The tissue-thin cover story disappears at that point. “An Israeli security firm has been chosen to provide security for London’s Underground train network. Verint Systems, a subsidiary of Israel’s Comverse Technology announced that Metronet Rail has selected Verint’s networked video solution to enhance security of the London Underground, according to an Israel21c report. You may recall that 911 days after the attacks on New York there was a multiple attack on the Madrid commuter rail system. On arrival at the scene the investigating officers noted that pieces of the floor of the attacked carriages were embedded in the ceiling. 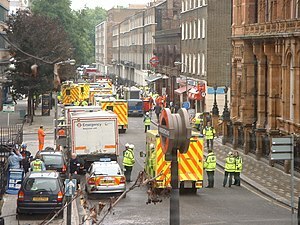 As with London the blast came from below, meaning that the perpetrators had access both to the signalling yards, and because of the perfectly synchronised blasts, the computer system controlling the movement of the trains. As with London the ‘security company’ overseeing the network was Verint Systems.